« FLOOR PLANS RELEASED at Arbutus Ridge Vancouver Westside Residences by Cressey! Between 623 to 1,419 square feet in amazing neighbourhood! Exclusive Richmond parkside apartments are now available at the newest presales release by Polygon Homes. The West Tower at Carrera Richmond condo presales is the second building in this beautifully master planned Polygon development with 2 bedroom parkside homes starting from just $389,900. The Central Richmond real estate development presents one of the BEST VALUES in Lower Mainland property. The sales centre is located at 6251 Minoru Boulevard Richmond BC. According to the Polygon Carrera Richmond parkside apartment marketing team, the project is the “new beacon for luxurious sophistication”. Located just next to the lush and beautiful Minoru Park, the West Tower at Carrera Richmond condo presales is a “unique oasis within the heart of a vibrant city”. Within walking distance to Richmond Centre and more than two hundred and forty stores and services in addition to being a heart beat away from YVR airport, the SkyTrain and downtown Vancouver, the West Tower at Carrera Polygon parkside Richmond apartments is the perfect place to purchase a new home. As well, the new project location is very close to the Richmond Library and Gateway Theatre in addition to all the great family, retiree and children oriented amenities at the fabulous Minoru Aquatic Centre and adjoining Minoru Arenas. More information is now online at www.polyhomes.com so make sure you visit their presentation office for more details today or you can simply fill out our online registration form for all the presales information. Here are some of the features of the 2nd phase at Carrera by Polygon just released! The architecture is clearly West Coast contemporary and is designed by GBL Architects. The project location is next to the beautiful Minoru Park as mentioned above and the close proximity to the Canada Line SkyTrain network as well as Richmond Centre present the best of shopping, dining, transit and entertainment that you can find in this city. As well, there are numerous parks and green spaces surrounding the West Tower Carrera Richmond condos for sale. The building itself will be concrete and will feature dramatic vertical architectural frame detailing with bold soffits that are complemented by the fine use of professional landscaping with fir and cedar trees around the property. As well, there is a spacious podium garden and plaza, manicured landscaping, water feature and a soaring double height lobby with great seating area, wood panelling, marble flooring and frameless glass entry door. The West Tower Carrera Richmond condos will have a full time live-in resident manager in addition to digital recording security cameras in the common areas. There is key fob access with floor restrictions in addition to a well lit underground parking lot. The homes feature heavy duty integral locking systems with reinforced door frames, lighting and door viewers at each suite entry. 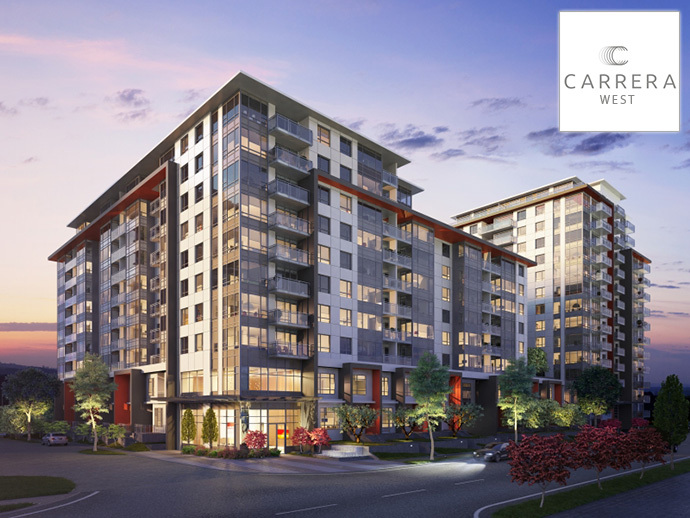 In addition, the presale Richmond Carrera West Tower condos will feature security systems on the ground level units and all homes receive the standard Travelers Guarantee Company of Canada warranty protection. One great feature that often gets overlooked is the expansive Carrera Club amenity spaces provided exclusive to the Carrera Richmond condo owners. Over 5,800 square feet of exclusive resident only clubhouse amenities at the Carrera Club are available year round for residents of this amazing property by Polygon Homes. There is a large patio area with BBQ for year round entertainment as well as an outdoor whirlpool spa. Other indoor amenity spaces at the Carrera Club include a fully equipped fitness gym, temperature controlled wine lockers (that are for sale), a social clubhouse lounge setting and a tasting pavilion that overlooks an infinity edged water feature. 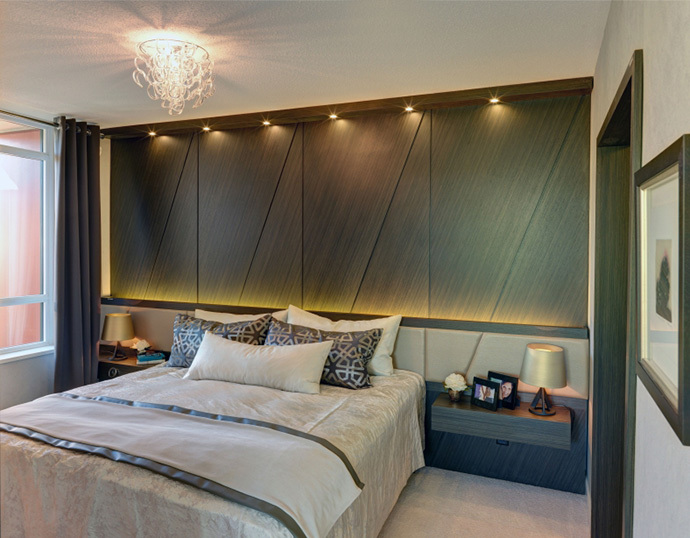 The West Tower Carrera condos in Richmond will feature similar interior finishes as the first phase release. All homes will have front loading stacked washer and dryer as well as vertical blinds for privacy. The gourmet kitchens at the new Richmond Carrera parkside condos in the West Tower will feature contemporary custom designed natural wood cabinetry in lacquer painted white or charcoal stained rift cut white oak which is elegantly matched with polished chrome pulls on the lower cabinetry. 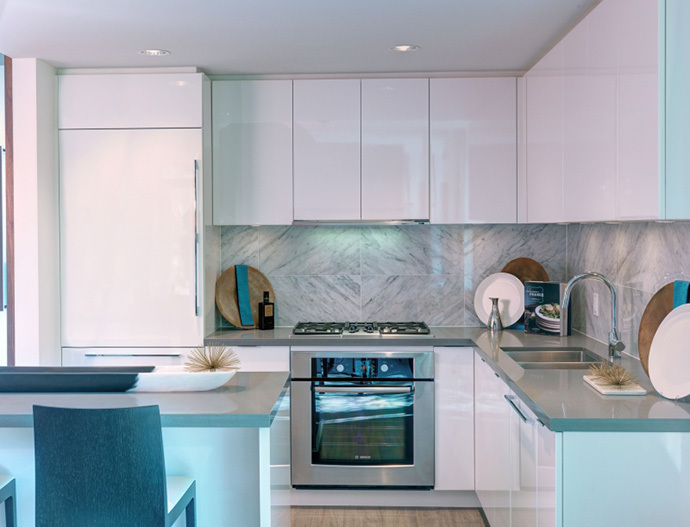 The Carrera Richmond condo kitchens also come with superior modern appliances that include a 4 burner Bosch cooktop (natural gas), Bosch wall oven (electric) located in the cabinetry tower with built in Panasonic microwave OR in the base of the cabinetry below the cooktop. There is also a large Liebherr counter depth fridge which is full integrated in addition to a Bosch integrated dishwasher. Last but not least, the West Tower Carrera Richmond condos for sale will feature a contemporary Broan Elite Simline hood fan or Bosch microwave/hood fan combination. Other features include full depth quartz counters, marble backsplash and custom under cabinetry lighting. There are soft touch close drawers and a lazy susan in select floor plans. Double stainless steel sinks are standard as is a dual roll out recycling bin station. Many of the homes at the West Tower Carrera condos in Richmond Central have unparalleled views of the neighbouring green space and some also have great views of the majestic North Shore mountains. All homes at the Carrera West Tower parkside residences have air conditioning, separate hydro metering and airy 8 foot 6 inch ceiling heights in main living areas. The upper levels may have higher ceilings as well. All windows are low E glazed and maximize sunlight and views. In addition, there are two designer color schemes that include Noir or Blanc and the spacious walk in or walk through closets in most master bedrooms have convenient built in shelves. 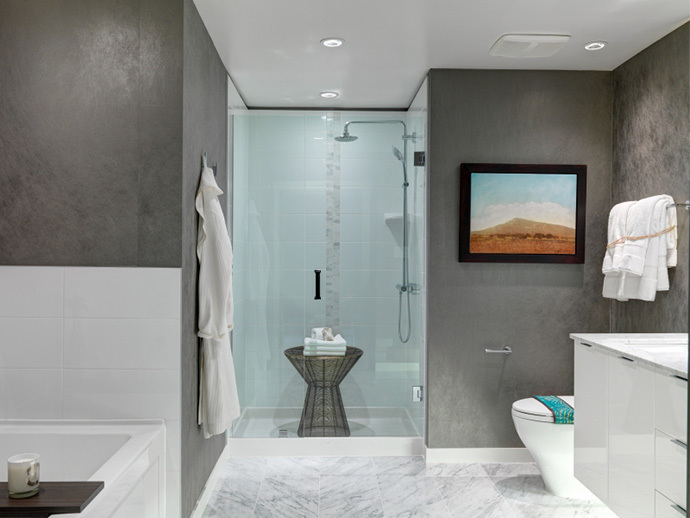 The luxury bathrooms have master ensuites with custom floating vanities, floating mirror, marble counters and under mount wash basins. In addition, the West Tower Carrera Richmond parkside apartments will feature floating solid wood cabinetry with soft close hardware, polished chrome shower controls with a European style thermostatic shower system with rain shower head and hand held wand. Other bathroom features include spacious walk in shower or soaker tub and shower, marble floors and chrome Grohe faucets. All homes have dual flush water closets for water conservation.